The Teledex iPhone™ A100/200 analog series combines a fresh new look with legendary Teledex qualilty and reliability. Suitable for virtually any type of hotel, iPhone™ A series boasts graceful, sculpted curves that accent a comfortable, familiar user interface. The iPhone A100 is the basic platform of the IPhone A series. Single-line non-speakerphone with no (0) programmable guest service keys. Perfect for lobby areas, or for budget-minded hotels that do not need guest service keys or a speakerphone. The iPhone A103 provides three (3) programmable guest service keys, along with Flash and Redial. The iPhone A110S is a speakerphone with ten (10) programmable guest service keys, along with Flash and Redial, plus Hold and Mute. The iPhone A101 is designed for use as a lobby phone, where no dial pad is required. Includes one guest service key, normally programmed to dial the front desk or switchboard operator. The iPhone A105 provides five (5) programmable guest service keys, along with Flash and Redial. 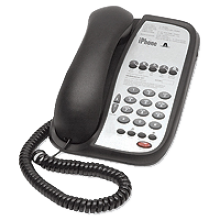 The iPhone A205S is a two-line speakerphone with five (5) programmable guest service keys, along with Redial, Hold and Conference keys. The iPhone A210S is a two-line speakerphone with ten (10) programmable guest service keys, along with Redial, Mute, Hold and Conference keys. The iPhone A102 is the same as the iPhone A100, but with Flash and Redial keys for added convenience. The iPhone A110 provides ten programmable guest service keys, along with Flash and Redial.